Providing dynamic, eye-opening safe driving presentations on what it takes to be safe on our roadways, whether you are driving, riding or walking. See why traffic collisions continue to be our number one 9-1-1 emergency call. This new awareness will help you to avoid (or stop) bad driving habits, helping to “reduce” your collision risk factor…making you a better – more alert driver, and pedestrian! Corporate Speaker for Companies: My talks help to reinforce your company safe driving policies – especially for employees driving company vehicles, such as no texting or other cell phone use while driving. I also take the place of two speakers, providing a professional perspective from the eyes of emergency responders, and as a victim. I’ve had personal experience with many of the major issues I cover. Military Safety Stand-downs: I offer hard-hitting talks for your safety stand-downs, especially prior to the holidays. Emphasizing the dangers and impact of driving under the influence of alcohol and other drugs, driving distracted (texting) and the dangers of riding motorcycles. Please note: My speakers fee is waived for military talks delivered within San Diego and Los Angeles County. Outside these areas – only travel expenses are requested. Colleges/High Schools: In arranging for my presentation to your group or class, I can target specific issues by request. My talks can range from 20 minutes, up to 3 hours or more, for your company conference, or military safety stand-down. I continually update my talks with the latest stats, pictures and videos to help drive home the message. Audiences will see what causes traffic collisions through my perspective as; a spokesperson for both a police and fire department, as a veteran air traffic reporter for local television and radio, through research, working with crash scene investigators, the Medical Examiner’s Office, and with several National Safety organizations. Types of crashes – rollover, side impact, rear-ender etc. Note: I speak on behalf of ALL those killed and injured in crashes every day! For references please see the comment section of this website to see audience feedback from previous talks. Additional references offered by request. Most of my talks are in the San Diego County area of Southern California, but I’m also available to speak outside the city & state by request! Email your request to monicazech@cox.net. In the last few years I’ve delivered talks in Los Angeles, Riverside, Miami, Florida, Rhode Island, Wyoming, Lyndhurst, New Jersey, and most recent at Fallon Naval Base in Reno, Nevada. For my speaker’s fee, please visit the “CONTACT” section located on the top bar, on the opening page of this website. Comments Off on Safe Driving Talks – Corporate Speaker, Military Stand-downs and more! Since 1984 I’ve had the honor and pleasure of speaking to thousands of people, of all ages, on injury prevention. My favorite topic & expertise has been “driving safety.” It’s wonderful to hear and see the feedback, especially if my talks, made a difference to the person writing. Diego. I believe every sailor would benefit from your safety presentation. opportunities. Stand by. Take care. This incident occurred in April of 2008, involving a near drowning at a local middle school. I was asked to address the media as a spokesperson for our fire department and the school district. Monica, you may not remember me, my name is Michael S., and I now work as the Director of Family program at the Cajon Valley Union School District. I first met you several years ago when I was an Assistant Principal in the district. During my time as an AP, a student nearly drowned. A P.E. Coach and I gave him CPR which revived him. I was so rattled and overwhelmed when the media started to arrive. Then like an angel you took control of the media and created a safe place for the administration to support students and staff. I never got the chance, but I just wanted to officially say, “thank you for helping our school during that challenging time.” I know you saved the day on other campuses when it came to the media, and again I wanted to say thank you for coming to the rescue when we needed you!! You are a rock in our community!! You live our district mission which is to make El Cajon the best place to live, work, play, and raise a family. Know that you are appreciated!! I’m emailing you to request a guest speaker for our Command Safety Stand-down. At our last Stand-down training our guest speaker was Monica Zech. Her presentation was OUTSTANDING!!! If possible could we have her conduct the training with us again. I understand that there is a request form that needs to be completed and emailed to you. Our Safety Stand-down is tentatively scheduled for 28 June, is it possible to have her as a speaker? Please contact me if you need more information and I will also need a request form. On May 4, 2017, I was honored to speak to Naval personnel at North Island again. The next day I received the following email. Thank you so much for sharing your awesome story. The word is that it was well-received by the command and I believe had a big impact on their lives. I think everyone walked away with something from your presentation. I appreciate you time and for volunteering to help wake people up to being safer and making better life choices! 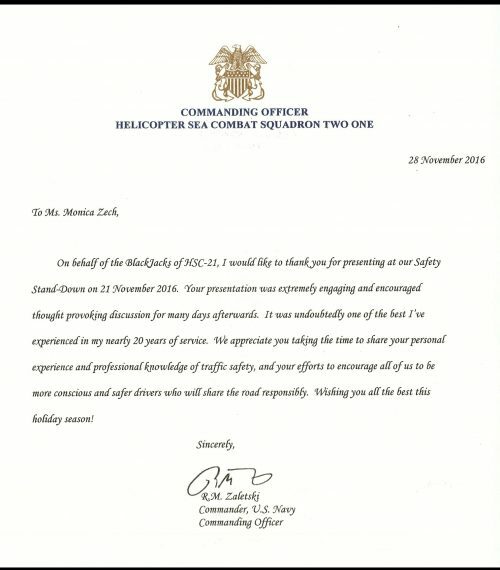 November 28, 2016 – Another great letter following my presentation at North Island Safety Stand-Down on November 21, 2016 to Navy personnel. Thank you! Today, Fri 18 Nov, you spoke at Camp Pendleton at the chapel to the MCTSSA Marines. I was there as a civilian marine having served on the past. The only regret I had about today is not coming up to you personally to thank you for your courage and passion in sharing your heartfelt “testimony” with all of us! It was the most impacting safety message I have heard in years!!! I can’t thank you enough for blessing me with what you shared today. Your message has been cemented in my mind and I want you to know that you certainly made a lasting impact on me with what you shared today! It will make me a more cautious and aware driver. I plan to share what I learned from you with my three teenage kids as well. I am so sorry for the loss of your father! My heart is heavy for what you and your family have to experience! I will definitely keep you and your family in my prayers and pray that God will continue to use you in a mighty way as HE did today!!! In my first year as an Air Traffic Reporter in 1984, I covered the tragic incident at the McDonalds in San Ysidro. First on scene from the air, I did all I could to keep others away from this area as shots flew in all directions, even toward the freeway behind the restaurant. Deeply impacted by this horrible day, I greatly appreciated the numerous calls and emails I received from the surrounding community, Border officials and other agencies – thanking me for keeping them informed, and for keeping many out of harms way. I later received a few news awards for my efforts. It’s hard to believe it’s been 32 years. I recently received this message from a fellow news journalist regarding this tragic day in San Diego history. Monica – You likely already know this but I just finished reading a digital review copy of Lisa Napoli’s book, “Ray & Joan” on my Kindle (release date is November 15) – and I saw your name listed in the acknowledgements section. The book is outstanding and of course I thought of you during the entire section which covers the San Ysidro 1984 tragedy. I sort of wished that the author got a chance to hear your voice on the Golden Mike 30-minute award submission because your reporting while flying overhead was outstanding. At any rate, glad to see you’re doing well and just wanted to say hello. Best, David (Kusumoto). I had the pleasure of speaking to seniors about safe driving at La Jolla High School, just prior to their high school prom. Several students came up following my talk to thank me for coming out and that my presentation had quite an impact on them. Could you send me an address where we can send Monica Zech a thank you letter for presenting at our Safety Stand Down? By the way, she delivered the best Traffic Safety/MADD brief I have ever seen!! It was outstanding!! Thank you for sharing your experiences and giving your time to Marine Wing Support Squadron 372 in Camp Pendleton. Your message truly resonated with our Marines and Sailors. I personally thank you for sharing your personal experiences. Those are lessons that I hope our Marines and Sailors can have learned through you, instead of learning them through their own experiences. Dear Monica, Your presentation was excellent! It is very thought provoking. The informationyou present is absolutely critical to preventing tragedies. We thank you very much. Keep putting the word out there and stay safe! I spoke at a National Charity League Father/Daughter day event held at the Miramar Speed Circuit. Many of the fathers came up with very positive feedback – including the email below. The girls and Dads enjoyed your talk yesterday. My daughter and I had a lengthy discussion afterwards, as your warnings about distracted driving resonated deeply with both her and me. In fact, she’s a bit intimidated with the entire driving experience and, at nearly 17, still only has her permit. Her reluctance is partly due to her sense of responsibility, and partly attributed to fear. Perhaps you have some words of wisdom to encourage her. Certainly, we are not pushing her and feel that it is important she is comfortable and confident before driving alone with a license. Additionally, I was wondering if you had any data pertaining to “time of day” related to the crash/fatality statistics. I am predisposed to think that a lot of the Red Light Running and DUI’s are late in the evening or very early morning. Of course, several of your videos of red light running were midday. I’m concerned about late night parties or after concerts/dances. Any thoughts on that? Again, I appreciated your wisdom. I was the person who approached you afterward, complementing your mellifluous voice! Thanks and best regards, Jim D.
My Response: I followed up with numerous websites that answered his questions and more. He forwarded them to the other fathers that attended. Some of which I’ll be adding to my website. Thank you ever so much! Dean said it was terrific and I have heard only positive feedback thus far. Monica, although I did read your website, I can’t image all you have been through. To share such personal tragedies as well as triumphs is a gift to us all. Wish so much I could have been there to hear you speak Monica! It does sound like our whole NCL Moms and Daughters would benefit greatly having you as a guest speaker! I will definitely pass your information along to the person who coordinates. We truly appreciate your spending your Sunday afternoon with us! Hopefully we will meet soon! All my best to you. Some comments come years later…. My name is Brittany H. and I am over seeing Fire Safe Kids (FSK) right now at the BI. I wanted to let you know that received your forms from May. I also wanted to tell you that 3-4 years ago you spoke to my Public Health class at SDSU and I loved your presentation. I still remember the presentation like it was yesterday and was really excited to learn that you also conduct a lot of the FSK presentations! I hope you meet you soon! Have a great day! April 26, 2013 – I just completed a series of three safe driving lectures to employees of the Southern Indian Health organization. Following my last presentation on April 26, I received the following email comment from a woman that attended the first talk I gave a few weeks ago. Thank you Gail! Monica; I want to thank for all the information you gave us here at Southern Indian Health in Alpine. I personally listened to every word you said, I then took that entire information home and told my husband, daughter and grandchildren and their friends. Thank God for you, that same evening my daughter was out and about with my grandchildren. She happened to be the first person stopped at a traffic light, when the light turned green she remained stopped and remembered what I had just told her of checking to make sure traffic stops before going with the green light – and about that time “a driver ran the red light” – and if she would have gone across as she normally would have who knows what the outcome would have been. Again your teachings are wonderful and I’ll always be forever thankful. You’re a true Blessing! In April of 2013 – I spoke to a group of San Diego area high school students enrolled in a San Diego Police Star Pal program called “Man Up.” It was a motivational talk on the consequences of making the wrong choices – bad behavior, alcohol and other drugs, DUI and other poor driving choices etc. This was the comment from the officer who invited me to speak after my talk – Thank you Thomas! Monica, you were awesome!!! All I can say is that, you’re GOOD! I am looking forward in seeing you in my next session of Man Up! Thanks again for your participation. Your presentation – it was a knock out! You have a way of making the awful palatable in little servings so we can at last face the reality. There was more than one wet eye in the house when you talked about your dad and daughter. I went home and hugged my hubby AND my dog! You left us all with images to fly into our imagination when we start getting stupid on the road…but you also made us all grateful for the ones we love. You were meant to do this, and I am very grateful that you did it for us. “Monica has spoken to my undergraduate Public Health students several times. She covers many aspects of safety, including texting and driving and drinking and driving. She also has spoken to my classes about the various professions associated with public health and safety. Monica is an excellent speaker and definitely drives her point home! The students consistently evaluate her presentations as “informative, enlightening, beneficial, eye-opening, and thought-provoking.” Her knowledge on the subject is terrific. She is an articulate communicator. She is an engaging speaker and has no trouble keeping the students’ attention. Her content is age-appropriate for college students. Each time I listen to her presentation, I feel inspired by her words. From: Robert Concha, Writer, Producer, Creative Director, Senior Producer of Mind Force Media, and Theatron Productions.com in San Diego. I was a keynote speaker at a parenting event in April 2011, I then received the following “thank you” from the coordinator of the event. I hope you are doing well. I wanted to let you know that the Survey Form we passed out for Family U, YOU were rated EXCELLENT SPEAKER on all the forms! “Dear Monica – You spoke to my Mom’s DAR group out in La Mesa (around 1990 or thereabouts). She LOVED meeting you and your sharing time with them-as did the other ladies! On behalf of my Mother, THANK YOU SO MUCH for enriching her life! Always a very safe driver, she took a Seniors’ Course just to make sure that her skills were still sharp (they were!). In May of 2007, at age 92, she renewed her Driver’s License, SCORING 100% on the WRITTEN AND THE BEHIND THE WHEEL EXAMS! Two months later, she died from a stroke, having been able to keep her independence right up to the last. And from myself, my own THANK YOU- despite your great personal loss of your father, you continue to contribute daily to Public Safety and the quality of life of us all. I want to extend a particularly heartfelt “Thank You” to you for being such an essential part of “The Death Experience” at Mesa College. Student feedback was astonishing. Many were moved by your blunt, straightforward message. Your skill in engaging with them in unguarded, frank discussions made a profound impact. You shaped outcome of the entire event. Transitioning our student’s critical thinking skills from sloppy uncertainty with lame excuses to cognitive discernment regarding real life consequences inside each choice they make, stands as our challenge. Progress was made that day. Thank you for all you do to keep our roads safe and people alive. The school is still buzzing about your presentation. (4/7/10) I cannot thank you enough. good for you. Again, it would be an evening time so parents could attend. P.S. As you probably know….today is National NO PHONE ZONE Day!!! So far we have collected almost 300 signed No Phone Zone car pledges from students and staff and they are still coming in to me each day! Monica – I cannot thank you enough for taking the time to present to the students and staff at Valhalla High! Your presentation was fantastic and I know you touched many lives today. It was wonderful meeting you and I look forward to the opportunity to work with you again! Monica, You were a pleasure to do business with and we truly enjoyed your visit. I believe that all that who were lucky enough to listen to your message, walked away with a new understanding (and fear) of the dangers out there. You do make quite the impact. My son said that it was all the buzz. His friends could not stop talking about it. You do great work and I hope to see you again in our fair city. With, much better weather. I will get the video to you and send you a copy of the article we write for our school newsletter. Thanks again for all that you do to keep us safe..
Another very nice comment following a safe driving talk I delivered to a Yacht Club in the beach area. Received October 9, 2009. I have been meaning to send you a note letting you know how much we enjoyed your talk our M. B. Yacht Club. Your speech did have an impact! That same evening there was an event at the club where alcohol was being served. One of the ladies that attended the meeting came up to me and said she and her husband had decided to spend the night on their boat at the club after the party. She said normally they would have driven home but your talk reinforced what they both knew and was a good reminder on drinking and driving. Thank you again for speaking to our club. I was thinking it would be beneficial to invite the juniors to this type of presentation next time. I won’t be the president of the group next year but I will pass on your contact information and the positive feedback I received to next year’s president. If there is anything the club can do for you please let me know. What a wonderful day – your presentation tonight was magnificent. Monica, you were truly great. You really did a super job and everyone was so pleased. Everything you brought out was so important and so timely. There wasn’t a soul in that room who was not directly affected. Thank you, thank you. Received this comment on 5/14/09 following a safe driving talk I delivered to a traffic school on 5/09/09 – thank you! I’m just E-maling you to thank you for doing such a wonderful job speaking at the CBI traffic school this past Saturday. I also wanted to let you know I just saw you on the morning edition of San Diego 6 news as the safety spokesperson. You are doing a great job all together and I hope you will continue to inspire other young drivers like you did for me. Monica- I wanted to drop you a note to say “Thank You” for taking the time out of your busy schedule to come and speak at Prof. Graf’s Health Education class last week. Your presentation was really eye opening and I’ve been making better decisions ever since! Thanks again and I hope to one day call you up to come speak to my class. I met you at Dr. Graph’s health class at National University. I am a special education teacher at a local High School. My students are 18-22 years old. I’m sure my students would be impressed and shocked by how dangerous walking around the streets could be. I thank you for everything you do for children and to ensure public safety. I always think of how many people suffer or die needlessly on our roads. It upsets me to hear of anyone dying, but these people are not at war and shouldn’t have to go through that. Thank you for everything that you do to help people become more aware of safety. Thank you for your time spent with us this week at our All Hands (military) Safety Brief. I found your brief interesting, educative, and (morbidly) entertaining. While I have never seen the level of trauma you have, I do have a bit of time volunteering with a county fire department.as a firefighter/EMT, and as an auxiliary police officer. I’ve seen what speed can do when a small car hits a telephone pole at high speed. (After hearing my talk) I have slowed down, given a 3-4 second distance in following, compared to the 1.5-2.5 I used to, and have caught myself looking several times both ways before proceeding through a controlled intersection. Not much, but at least I will have more reaction time if I am involved in something I can’t avoid. It really brought it home when you shared with us the loss of your father, and the incident your daughter was in. Just wanted to thank you again for so graciously and expertly presenting last night for AAUW. Everyone was raptly attentive, and I think we all learned some interesting, new things along with being graphically reminded of much we know, but often forget to follow! You certainly know your material, and your passion and sincerity come through glowingly. Well done! Just had an email from our president, Rilla, and she expressed her praises for your talk, and wished she could have heard the full 2 hr. presentation! Ever thought of starting a Fan Club? Please know how much I appreciate your willingness to give up so much time for my group. Thank you for your presentation. You did a terrific job. One highly reliable mark of a good presentation is when people stay over to talk to the speaker, voting with their feet as it were. You had lots and lots of people doing so. So, kudos! I am late, but don’t want miss the deserved opportunity to say how enjoyable it was to hear you at SDG&E’s Safety Standdown in El Cajon. In so many, many ways you informed and educated employees on driving and it’s potential ugly consequences. Personally, I didn’t want to drive back to the home office or go home that day. Again, your energy and passion was remarkable! My name is C.M. and I was privileged to attend your presentation at our monthly TIP continuing education meeting Monday evening. Along with most of my fellow volunteers, we were terrified to drive home that night but certainly came away from your presentation with many sobering facts and figures. Thanks so much for the “wake-up call/reminder” to our group…..especially some of us more “mature” drivers! Thanks again for a most informative evening! Thank you again for yet another outstanding presentation to HSL-47! We greatly appreciate the commitment of time that you have given to us, and we are more safe on the roads and at home, and are better prepared for the “unknowns” out there. If we can ever assist you in any way, please don’t hesitate to ask. I heard you speak at SDSU in Professor Graf’s class last week. I just wanted to email you and thank you for your powerful presentation. It definitly made an impact on me. You opened my eyes to more possible career opportunities and you motivated me to stay in the health field even more. I never have thought of working as an EMT, or 911 dispatcher, yet now that I know of them in more detail they are on my list to consider! Thank you again for your motivation and guidance. I am at a point where I am lost and trying decide which road to take after I get my bachelors in Public Health. I have two semesters left to decide, and your words helped me realize how much I want to work one on one with people. In June I was very honored to speak to audience of doctors and nurses at a trauma conference at Sharp Memorial, I’ve posted their very nice letter of appreciation. We would like to express our gratitude for your excellent presentation “From What I See –Why the Rush to Die” at our June 29, 2007 Advanced Trauma Symposium. The participants consistently evaluated your presentation highly. We thoroughly enjoyed your presentation style – and so admire and appreciate your message. We sincerely thank you for your time and expertise in making this a successful program. People are still talking about some of the stuff you showed. Just walking around the ship I’ve overheard people talking about this or that from the presentation. In my experience that’s pretty unusual as almost always an hour after the presentation is over, people have no clue as to what was put out. Thanks once again for appearing on such short notice and giving us a memorable presentation. In all likelihood we may call on you in the future. The Monte Vista Staff and Senior Class wishes to thank you for your presentation to drunk driving and the problem that the mixing of alcohol and automobiles can create. The video presentation (power point) was a very real look at what can actually happen to those who are driving impaired. Many students made positive comments and left the presentation with a greater awareness and vowed not to drive under the influence. Monica – On behalf of the 9th grade students and staff at Santana High School, I want to thank you for the information and engaging presentation you gave. I think you should be pleased to know that all our teachers reported their students engaged in lively conversations the next day. You made quite an impact! I recently met you when you visited my traffic school session in Escondido and gave a powerful and touching presentation a few weeks ago. I asked for an informational booklet on the El Cajon Fire Department. After reading it I became very interested in pursuing my career into the fire service. I would really like to become a paramedic or even a fire fighter. My friend and I have already set up a ride along with a North County area Fire Department. I am very excited and I cannot wait! I would like to know if it wouldn’t be too much trouble if you can send and give me more information on becoming a paramedic or fire fighter. Thank you very much it will be very well appreciated! I saw a presentation by you in a class I was taking from G.Graf last month in Pacific Beach. I was deeply affected by your lecture and was wondering if you would possibly consider speaking to my church’s youth group sometime in May. I spoke with our youth minister and she is interested if you are available. If you can do it, I will provide you with her contact information. Thank you for your time. I wanted to thank you for a fantastic presentation yesterday. You really were the highlight of our meeting! People couldn’t stop talking about how informative and real your message was. I think you hit home in such a huge way and I truly believe that you’ve impacted each and every one of our lives. And for that, I thank you very much! It was such a pleasure meeting and having you at our first safety meeting. I don’t know if my counterparts in San Diego have used you before, but I will definitely pass along your name and contact information for their next safety meeting. I hope that we can work with you on future safety meetings. I would like to offer my thanks for your outstanding driver-safety presentation at the HMH-361 Safety Stand-down. Your presentation on the consequences of traffic violations, aggressive driving, road rage and driving under the influence was exactly the upfront type of training needed by our Marines. The visual aids provided graphic amplification to the points presented in the brief and kept the audience focused. I sincerely hope that our Marines incorporate the information you provided to become more conscientous, defensive and safe drivers. Your initiative and professionalism are a credit to you, the El Cajon Fire Department and the City of El Cajon. On behalf of the Marines of HMH-361, thank you for a job well done. Thank you for presenting the “Fire Safety Assembly for Third Graders” at Magnolia Elementary School on Friday, Sept. 23rd. The students loved it! You are such a celebrity and the students greatly enjoyed your presentation! Your message was taken to heart by everyone there. Thank you for bringing the three firefighters too! Even though they couldn’t stay for the entire session, they were as popular as ROCK STARS by the crowd of children!!!!!!!!!!!!!!!!! I am not kidding. Their uniformed presence and friendly nods held the children in awe of them. You can be sure the Magnolia audiences really appreciate their visitors! Thanks again for your wonderful work! You are such a lovely person and a fantastic role model for kids – and teachers as well! I was in the class for drivers education at OLP this week and I heard your presentation. Your speaking really reached through to all of us, and I can see that it will be very beneficial to all of us also. Thank you very much for taking your time to speak to all of us, and your dedication to help us realize the importance of safe driving. Ms. Zech’s persentations about traffic safety is a wonderful compliment to my driver’s education and health classes here at Sweetwater High School. Her amplified golden voice captures the attention of the students. The slide program, with it’s high impact photos holds their attention. Thank you for allowing Ms. Zech present to my classes, I look forward to her return next year. Thank YOU Monica! Your presentation was phenomenal. I left there wishing that every friend and family member of mine was there to hear it as well! You do amazing work and I’m sure you are saving lives every day with the things you say. I know I will certainly drive differently and more cautiously than I have in the past. I love what you said about “karma” and that accidents are NO accidents. What a different perspective to have in our heads while driving and dealing with pushy drivers. I’m sorry for the losses you’ve had in your own family. It’s easy to see why you feel so passionate about car safety! It’s clear to me that you are fulfilling your “purpose” all right! You are honoring the memory of your Dad and Sister every day. Thanks again, so much for taking the time to speak to our club. I know we’d absolutely love to have you speak to us again. Only next time I will encourage everyone to bring their spouses and friends! There were approximately 450 people there for your presentation last week. Thank you so much for a fine presentation. I have received a number of positive comments. I am sure your presentation hit home for a number of Marines in the audience. With the help of people like you, we can make a difference! Thank you Monica, Your presentation was great!!! And very well received by everyone. Keep up the good work!! And To: Marie, Thank you for your great selection of Monica for our stand-down. Thank you again for presenting at our Stand Down! Your presentation and materials were awesome – I really think you made a positive impact on many of us. Thank you for the article. I will use it in Drivers Ed as well as in Traffic Violater School for La Mesa Driving School. Keep up the good work. You are doing an excellent job for us and I always welcome hearing you speak! Monica: Thank you for providing the resources to the public that you do. I believe you ARE making a difference in people’s lives, their way of thinking and giving them food for thought. We can always improve on how we can help others, our families and ourselves. Thanks for being there. Greetings Monica, and thanks again for your work on Friday. I believe you made a big impact on our group and their were several folks who commented positively afterward. I am the guy from Helix Water Dist. who asked you today about the collision at Mollision and Main. Thanks again and I truly enjoyed your part of today’s class. You are an excellent speaker. You gave your talks on driver safety and fire safety at SDG&E’s December Safety Standown 03′. You were my favorite speaker that we had all year. I had heard your talk at a different standown when I was a meter reader. I wanted the department I work for now to be exposed to the same information. Our company is very safety conscious. Your graphic pictures helped to remind us what happens if we don?t follow what we have been taught. Your timely presentation impacted our group, EGIM. You should be commended for the mission (on safety) that you have undertaken. I hope that you are. I drove my grandson home from the meeting (to my house) and he told me that I was 5 seconds (following distance) behind my daughter’s car. He said that that was good because 4 seconds would be acceptable. I saw several people that were at the meeting, at the lake this morning. They loved your talk. Thank you so much. My grandson’s attention never wavered from you. He was riveted on your every word. Take care and blessings back to you. The kids loved you! I already had some ask me to write down the web site address, so that they could look up additional info and write to you from home. I loved how engaged they were–it was great! Thanks sooooo much again!!! I’m sure you’ll be hearing from us soon. lesson in my head right now. Anyway, I want to pas this on and make sure you keep saving lives. We’ll never know if you today saved my life, or one of my family members. In the big picture it’s highly probable. Please forward this note to the Fire Department or any others who might be interested in the value of your current position. I’m going to pass on your information to our school’s resource center. Our little high school needs your services! I was sorry to hear of your father’s death, too, (killed by a DUI driver 6/92) and understood completely how that must have happened, because I was almost hit the same way not too long ago. I just want to say, how much I personaly enjoyed your presentation this past Tuesday. I value all the information that you have passed on to me, and will carry it with me for the rest of my life! In addition my children will benefit from the knowledge I have obtained from you. Note: I love speaking to “paenting group, new parents, or soon to be parents” in which I talk about being a better “safety role model” for their children, and the mistakes we often make as parents without realizing it. The response from these talks has been over-whelming as shown in the following emails. I would like to take this opportunity to thank you for speaking to the Grossmont Mall Walkers on Saturday, September 13, 2003 regarding “Stay Safe, Be Safe.” As you can see from the evaluation summary sheet, the participants really appreciated this talk. I appreciate the professional manner in which you presented the information. Participants walked away with an understanding about how to stay safe when walking, driving and in their home. Thank you for honoring this commitment after your accident. Your personal experiences added greatly to this presentation. On behalf of the Grossmont Mall Walkers, I thank you. I would like to thank you once more for your presentations. Parents were grateful for the information. It was so much of an impact that a male parent kept his wife awake until 3:00 a.m. talking about what he had learned that night. Another parent, (female) admitted driving under the influence once in a while, not anymore! I wanted you to know that you make a difference and we are very grateful. Thank you for answering all our questions. Hope to see you in my future parent education classes. Monica Zech made a safe driving presentation to my parent education class at Foothills last Thursday evening. (February 6th) I wanted to let you know that she put on a fantastic presentation. I have heard “safe driving” talks dozens of times, but her presentation was different. Her manner isn’t to lecture and cram her beliefs down your throat, she just told us why she doesn’t do certain things. It really made me, and others in the class, realize the risks we take without realizing it (and the horrible consequences of our actions). I’ve caught myself doing “DWS” maneuvers and changed my driving behavior in just a these past few days (why does her distinctive voice keep haunting me when I get behind the wheel?!?). I wanted to pass on to you what a great job Monica is doing in the community. Your words at our home that evening have echoed through many teenage ears. God knows His Works are through you. According to my friend E, her twin girls will never question her again about “not trusting their friends”. They now agree with her if she asks them not to ride with certain kids. My seven year old is now playing the seatbelt race game, after you mentioned your daughter did this. My eldest daughter has told lots of other people and said that you were totally not boring and the programs at Girl Scouts is looking to coordinate an older girl forum of Hot Topics and ask you to speak. Hi, I would just like to thank you for your presentation in our driver’s ed class yesterday. That class has taught me so much about driving safety, thanks to speakers like you, I’m sure it will help me many times in the future. Thanx again. Thank you so much for your wonderful talk last Saturday Morning. My son, Trevor, came home just bubbling over telling me all about how really terrific you are! I really think the lessons you taught sank in for him. He was most impressed with your gallery of photos and described nearly all of them in great detail to me. Both my sons heard you speak at Valley Center High’s Driver’s Ed class. They said you were great. That is as high of a compliment that you can receive from teenagers. Have a great week. I want to thank you loads for the great talk that you gave at our Home Owners Association meeting. It was absolutely perfect, and just exactly what we were hoping for. We are trying to generate enthusiasm for our Emergency Disaster Program within our resident community, and it is slow in coming. We have our share of elderly infirm people who want and expect to be helped, but those who can and will do the helping are few and far between. So we are trying to get the message across that each individual household is responsible for its own emergency food, water, etc. You hit the nail on the head. We all thank you. Thank you again, Monica. You are such an asset to East County. Following a guest appearance on a KPBS radio show on “Aggressive Driving”, I mentioned my safety web site. In response, I received quite a few emails from those who miss my traffic reports and thanked me for being so involved with safety. I thank you for your compliments. Your comments were very much appreciated and heartwarming. But the following email touched me deeply…. I have a friend who is a Vietnam War veteran , as I am. Some years ago, “Ed” told us that he still got uneasy when he heard a helicopter flying overhead. That surprised me because that sound is still welcome to me; it reminds me of a chopper bringing chow and mail, or taking me to a better place. I saw “Ed” about a year later and he told me he was a new man, and didn’t worry about helicopter noise anymore. True story. Give yourself a pat on the back, Monica. Just read your post (of safety comments) at ncdsa.com and wanted to say thanks. I never really WANT to put on my helmet and pads but always do, ever since becoming a mom! I can’t stomach the thought of leaving my little guy motherless just for the sake of an equipment-less ride. Plus, I have to do the role model thing now…anyway, just wanted to say I appreciate it. Hope all those guys do. More Coments From The Military Bases: Here are a few emails I’ve received following Safety Talks at the MCRD Miramar Base Theater and Camp Pendleton – I had a great time! I want to thank you on behalf of the Youth-to-Youth Helpline for putting our (crisis) information on your website. One of our youth was able to access it by putting in keywords such as “youth and help and helpline”. We appreciate your support in getting the word out to the youth of San Diego County. I saw your brief today at Camp Pendleton. It was the best I’ve seen in a long while. Thanks for sharing your knowledge and enthusiasm with us. I was at the safety stand down at Camp Pendleton today. I thought you did an awesome job! As always though, theres those knuckleheads who will never listen and shrugg it off, and I hope they learn. Have a happy holiday, and God Bless!